Early evening outside the Paul and Rosemary Trible Library on the campus of Christoper Newport University in Newport News Virginia. Our son Michael graduates from CNU tomorrow and the Candlelight Ceremony was held tonight. Former U.S. 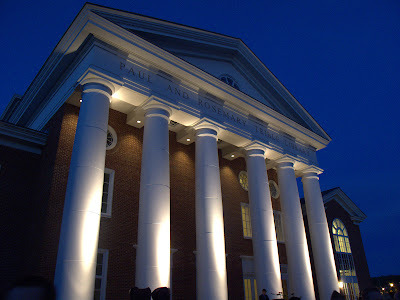 Senator from Virginia Paul S. Trible, Jr. has been the President of CNU since 1996 and has transformed the university. The new library was dedicated last year to honor President Trible and his wife Rosemary for their leadership at this up and coming public liberal arts college. Canon G10, 1/13 sec at f/3.5, ISO 400.